With careful research, help and knowledge from professional brewers, Festival Premium Ale Kits enable you to recreate examples of some of the UKs best loved beers, all within the comfort of your own home. Festival Premium Ale Kits use only the very highest quality liquid malt extracts (3kg per kit) and genuine brewers yeast strains (all individually suited to each style of beer). Festival Premium Ale Kits also contain hop pellets and priming sugar. The hop pellets are simply added halfway through fermentation infusing flavour and aroma into the finished beer resulting in a beer with more hop character than ever before. The precisely measured addition of priming sugar ensures the correct level of carbonation is achieved for each particular style of beer. Each kit contains only the finest quality ingredients and easy to follow step-by-step instructions (Each kit makes 40 pints) making Festival Premium Ale Kits the UKs most comprehensive and complete premium liquid malt extract beer kit ever produced! Check out the video guide to the left showing the making of the Festival Pride Of London kit. Showing 2 of our total 7 reviews, with an average rating of 5 stars. 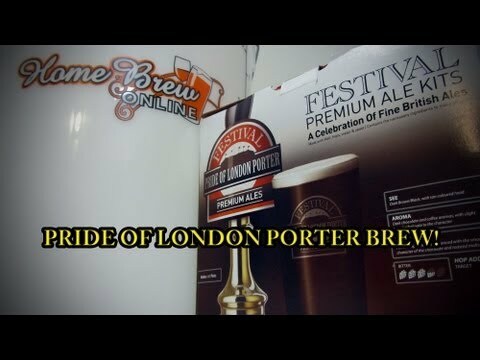 Read all 7 reviews for Festival Pride Of London Porter Kit. This kit makes a lovely dark bitter, malty and quite dry. Suggest at least a month in bottle before tasting and the flavour improves with keeping - should be really good after 6 months. This is the second time in 6 months that I have brewed this beer. Originally, I only bought the first kit as an experiment but I liked the product so much that I had to make some more. I tend not to follow the timing instructions contained in the kit, because fermentation will depend on the ambient temperature, and so in winter months at 18C I don't add the hops until about day 8 or 9 and leave the brew to carry on for another 10 days or so after that. I bottle mine straight from the fermentation vessel, with a conditioner tablet rather than the supplied sugar (which I add to the brew at the start for a little extra strength), but after two weeks clearing/conditioning and 4-6 weeks cold storage to mature (if I can resist for that long), I find the beer has a wonderful full bodied taste with not too much hoppiness. It also produces a great head when pouring, not unlike Guinness although the beer is nothing like that in flavour or colour. I will be making this on a regular basis in the future, or until my liver calls time on me.